It was a real pleasure and a privilege to be one of the twenty international participants of the this course which was jointly organized by ICCROM, the Getty Conservation Institute (GCI) and the Non Catholic Cemetery, and was held in Rome from 15 April to 3 July 2015. During twelve weeks I attended to different lectures from renowned international art historians, geologists, conservators, architects, engineers, archaeologists, and conservation scientists. Every lecture was very different from each other but they were all focused on stone as a material and how it reacts in different environments or contexts. There were also laboratory sessions: microscopy, petrography, porosity/capillarity tests, mortar analysis, salt analysis, and identification of bio organisms found on stone. On the practical side there were different exercises carried out in the Non Catholic Cemetery in Rome: documentation and recording on site, mapping exercises, and conservation treatment of different monuments in the cemetery. 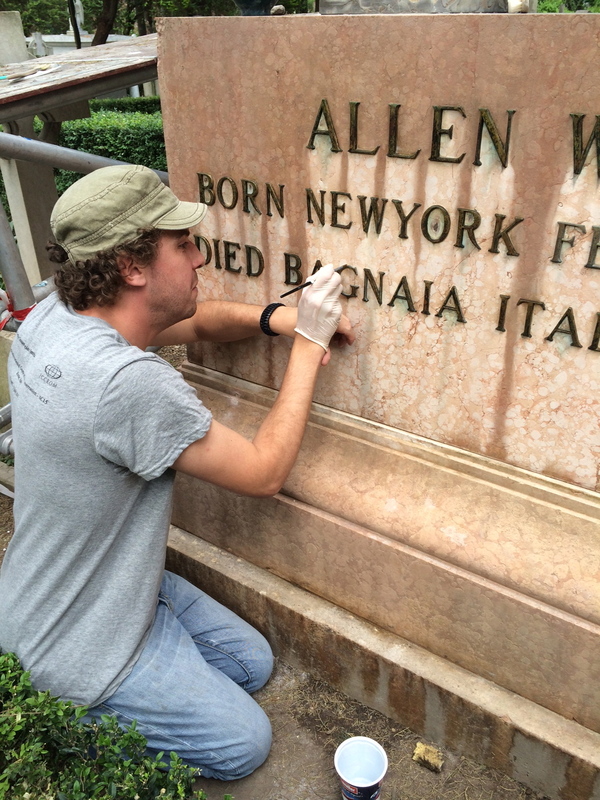 For the conservation of one monument at the cemetery I formed part of a four people team. My colleagues were from Georgia, Turkey and Tanzania. Together we managed to complete a difficult conservation intervention of the Wallace tomb, a very interesting monument composed of three different stones: Travertine, Marmo Rosso, and Nero Portoro. We also had different guided tours around Rome and one week study tour around Italy. These study tours were really interesting as we had the opportunity to see hands on conservation in monuments like the Fontana di Trevi, Santa Maria Antigua in Rome, the Vatican conservation studios, the Pisa Cathedral, or the Rialto bridge in Venice among others. On these tours I had the opportunity to discuss different, and sometimes new, conservation treatments. Another very important aspect was sharing time with the other participants from different countries: Finland, Austria, Serbia, Italy, Poland, Palestine, Malta, Turkey, Egypt, Georgia, Colombia, Perú, México, Canada, Zimbabwe, Tanzania, Philippines, Japan and Hong Kong. During three months we have made very good friendships and a professional network that I hope will last for many years to come. During the course we discussed different approaches and conservation problems that each one have in our own country and now we have online forums were if someone has a question each of us gives their opinion. So I feel that the course has somehow not finished and I still learning from my other colleagues. All these lectures, laboratory exercises, and field practical work have broaden my knowledge in stone conservation. Now that I have completed the course I feel enriched by the whole experience but time will have to pass until I process all the information gathered during the three months. I am really looking forward to meet my students next academic year so I can share with them some of the new topics I learned, especially on the conservation of outdoor monuments. This is especially relevant for the project I have been co-ordinating at the Kensal Green Cemetery in London. For more than two years now City & Guilds of London Art School and the Friends of Kensal Green cemetery have been collaborating together to conserve some of the listed monuments and other stone objects. The monuments in Kensal Green have very similar problems as the ones in the Non-Catholic Cemetery in Rome and my experience in ICCROM has definitely met my expectations. Albert treating the Allen Wallace tomb.